Torontonian Freddie Shore, a man who has always had a love for athletics, is giving back to the Miles Nadal Jewish Community Centre, a place where Freddie still makes a big splash early in the morning. Through UJA Federation's Tomorrow Campaign, Freddie recently made a generous and visionary gift of $1 million to the MNJCC, the place that he credits with getting him into the swim of things following an unfortunate accident that saw him break his knee, marking an end to his competitive sports “career”. A passionate `downtown’ leader and committed community volunteer, Freddie, through his gift, has recently named the Freddie Shore Wing at the Miles Nadal Jewish Community Centre. 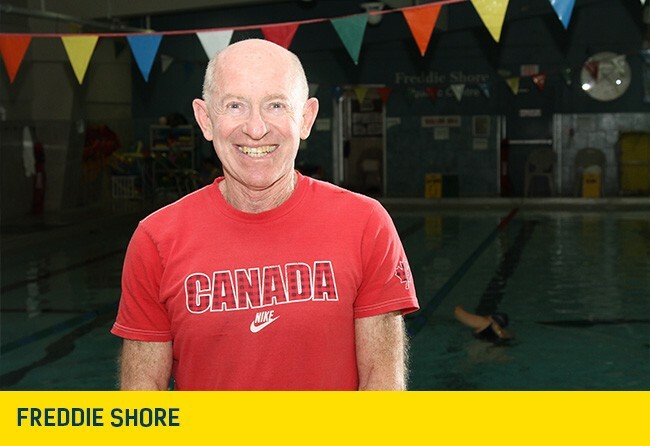 Along with his gift that named the Freddie Shore Aquatic Centre, he also created the Freddie Shore “Learn to Swim” program – an ongoing commitment to provide lessons to any child who needs them, no matter what their family’s financial constraints may be. All of these gifts are examples of his outstanding philanthropic vision and commitment to Toronto’s downtown Jewish community. As a young man, Freddie Shore was an avid athlete, excelling in track & field, football, basketball and a myriad of other sports. At that time, he was a member of the Bathurst (now Prosserman) Jewish Community Centre at Bathurst and Sheppard. After graduating from the University of Toronto in the ‘70s, Freddie moved downtown and joined the venerable Bloor Y, which, through UJA Federation’s Tomorrow Campaign, was rebuilt as the new, state-of-the-art Miles Nadal Jewish Community Centre. He enjoyed playing team sports in the old gymnasium, but while on a trip to Mexico in the ‘80s, Freddie broke his knee and that unfortunate incident brought an end to his participation in physical sports. Never one to give up, Freddie instead turned his physical interests to swimming in the pool at the JCC where, he became quite an impressive swimmer, and, like clockwork, Freddie has been swimming up a storm at the MNJCC ever since, where he’s usually the first member to appear every morning, making a splash in the pool regularly at 5:30 a.m.
Everybody knows Freddie as ‘the guy in the short shorts’. Freddie is ‘family’. He is loved by all the staff and he has even attended their weddings and other important events in their lives. Freddie has also left a Legacy Gift that will help children ages 4 months to 13 years who otherwise could not afford swim lessons; and also provide aquatic leadership courses for older students wanting to take courses like Bronze Medallion, Bronze Cross and the National Lifeguard Service course.